As I vegan, I don't like to think of all the things I choose not to eat, I like to think about all the things that I do choose to eat. 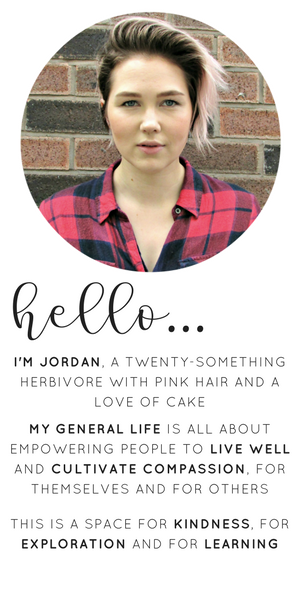 It's a far more positive and optimistic way of looking at veganism, rather than viewing it as this lifestyle of restriction - which is how I saw it for the 26 years before I went vegan. Anyway, since transitioning to a vegan lifestyle, I've made it my mission to find ways of enjoying "normal" foods in a vegan friendly way. So today we're talking the good 'ol cooked breakfast. I love a good cooked breakfast and have done for as long as I can remember. I know they're not viewed as being the healthiest of meals, and let's be honest, in their traditional form they're not. However, I like to think that my vegan version not only provides some of my favourite flavours, but is also a wee bit healthier too (providing you can rein yourself in on the hash brown front). 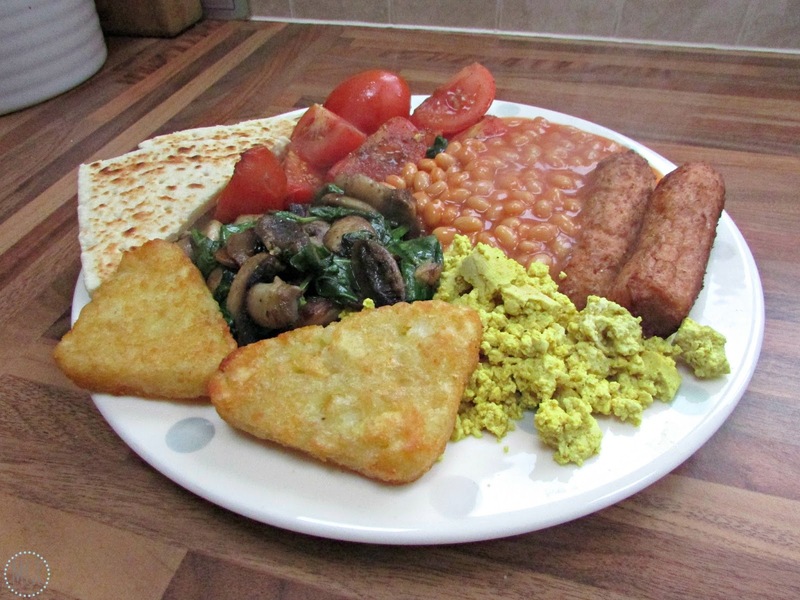 So what goes into a vegan cooked breakfast? Well, we've got the "meat replacer", which for me means Linda McCartney sausages, because they are the bomb. You can get vegan bacon, but I haven't tried this as to be honest the sausages are enough for me. Then we have the "egg replacer", a.k.a scrambled tofu. To achieve this you basically take a block of firm tofu, crumble it in a pan, add 1/2 tsp of turmeric (to make it look more eggy) and 1/2 tsp of black salt and warm through. Black salt contains sulphur which smells and tastes eggy. I picked up this tip from Hello Gemma's Ebook, The Vegan Kitchen, which is an excellent read if you're a new vegan or just fancy some reasonably simple but delicious vegan recipes. In case anyone was wondering, I ordered my black salt from Amazon*. I also like to bulk up on the veggies. Since going vegan I've discovered an affinity for mushrooms - something which I avoided like the plague for years as I believed they felt like slugs in my mouth. These days I can't get enough of them and so I like to cook them either in some dairy free margarine or a little bit of oil and water. Either way, I like to add a bit of garlic and some spinach, because what is a meal without greens. I also love to add some tomatoes which I tend to cook alongside my mushrooms for ease, however, you can also grill or bake them. And let's not forget about baked beans (technically one of your 5 a day so they can hang out here with the veg). You can make your own, but I like an easy life so tinned do just fine for me. Now, last but by no means least, let's get to the carbs, of which the possibilities are pretty much endless. I love a good hash brown, so these have become a welcome addition to my vegan brekkie. The crispier the better if you ask me. Other carb options include, but are not limited to, potato cakes (nom), fried bread (double nom), toast, crumpets and English muffins. You can literally go as wild as you fancy on the carb front. 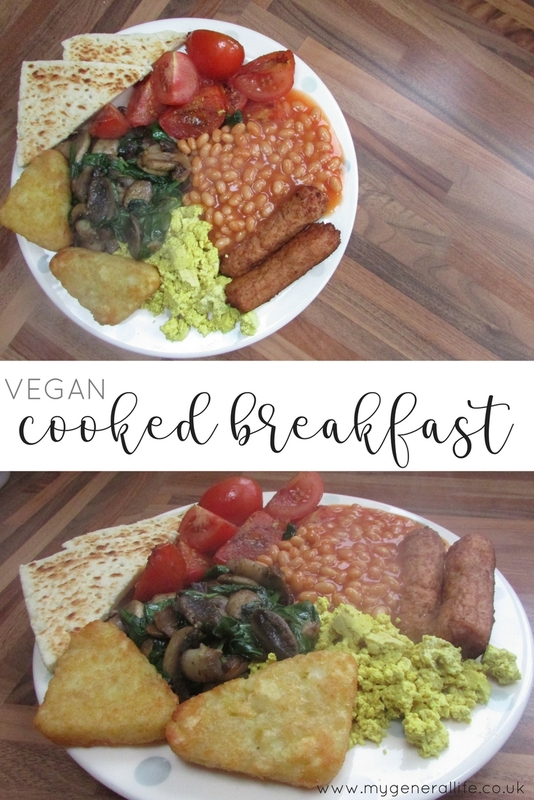 Now if you ask me, all of the above makes for a pretty full and tasty plate - packed full of protein (from the tofu, sausages and beans - so don't even try that vegans lack protein bull) and veggie goodness. I honestly don't feel like I'm missing out at all, plus with it being that bit healthier and less greasy, it's something I feel happy eating on a more regular basis rather than as the occasional treat. * denotes affiliate link - it will not cost you a penny to click this link, however, if you were to purchase an item through the link, I would receive a small commission at no extra cost to you. DIY Deodorant [VEGAN & CRUELTY FREE]. 5 Steps To A More Sustainable Life.